Readings of Gulliver’s Travels are diverse enough to have spawned histories on the critical debate itself. The work was an instant success; upon its anonymous publication in 1726, “it […] became the only subject of conversation; everybody wondered, everybody admired, and everybody sought for meanings that were never intended” (Character of Swift 331). Within a month of its publication, John Gay wrote Swift to say that if the author would return to England, he would “have the pleasure of a variety of commentators to explain the difficult passages [of his own book] to him” (Corresp. 184). Gay also informed Swift that the public generally regarded Swift as the work’s author (268), and from this early stage in the critical debate through the late-nineteenth-century, few critics distinguished between Swift the author and his imaginary cousin, the narrator, Gulliver (Fox 280). The Voyage to the Country of the Houyhnhnms was therefore generally regarded as the misanthropic ramblings of Swift’s own diseased mind; the Houyhnhnms represented Swift’s ideal for mankind and the Yahoos were his “ridicule on human nature itself” (Orrery 41). Yet arguably beginning somewhere between A.O. Lovejoy’s 1920 essay, “The Pride of the Yahoo” and John F. Ross’s 1941 piece, “The Final Comedy of Gulliver,” critics began to see the fourth Voyage in a new light: “Gulliver in the last voyage is not Swift” (Ross 74). This new reading rendered Gulliver a tool of the satire; these critics note that Gulliver might as well be named “Gullible,” and that the reader himself must judge the narrator’s thoughts to be simple-minded (Fox 285). In Lilliput, Gulliver “sees little people where he should see little minds” (285) and readers should thus not be surprised that Gulliver is taken over by the Houyhnhnms’ false dichotomy between themselves and the Yahoos. Yet if the reader is not surprised, he or she must also understand that the dichotomy is overly simplistic; Gulliver is neither one nor the other and neither are readers. Critics now widely accept the separation of author and narrator, but still interpret the work from two different camps. These camps generally differ in interpretations of the meaning of the Houyhnhnms and Yahoos, the purpose of Captain Mendez, and the meaning of Gulliver’s insanity at the Voyage’s close. The first, “Hard” school of thought, operates under the same basic principles as the early critics who linked Gulliver and Swift. In the school, the Houyhnhnms are Swift’s ideal for mankind, and the despicable Yahoos should depress or even anger the reader. The hard reading of Gulliver is difficult to justify; in letters to Pope and Bolingbroke, Swift explains that he has always rejected the definition of man as a rational animal, and it is therefore unlikely that he could have comparatively high standards for mankind. In the same letters Swift explains that he does not hate mankind; on the contrary, he feels that holding men to unattainable ideals is true misanthropy. Readings of the Yahoos as Swift’s hatred for mankind therefore seem similarly misguided. The second, “Soft’ school of thought, operates under the same principles as the critics who see Gulliver as an object of the satire. The soft school seems easier to agree with; if Gulliver was insane by the end of the fourth Voyage, and madmen was “Swift’s term for those who misuse and abuse human reason” (Monk 319), then it follows that Swift intended his readers to be skeptical of the narrator’s opinions. The madman narrator device was a common tool of Swift’s when he wanted his readers to be critical; just as we are wary of the narrator in A Modest Proposal, so should we be with Gulliver. If the soft school is easier to agree with, or rather, more difficult to find fault with, it should be asked what purpose Swift might have intended in the fourth Voyage. It is likely, I would argue, that the fourth Voyage is a critique on the uncritical mind—the mind which fails to recognize the falsity of a dichotomy between Houyhnhnm and Yahoo and the absurdity of the Houyhnhnm ideal driving Gulliver to madness. Yet Swift did not intend this critique to exist within the vacuum of his own literature; Swift also placed the critique within a real-world debate, the same one that he mentioned to Pope and Bolingbroke—whether or not man is a rational animal. Perhaps debate is the wrong term. In 1726, that man was a being defined by rationality was largely uncontested, yet Swift sought to debate the issue. Indeed, R.S. Crane notes that the elementary logic literature Swift would have read at Oxford, Cambridge, and Dublin, ranged from Burgersdicius to Milton, but would have categorically contained the formula: Homo est animal rationale (850). The formula often appeared “without comment or explanation as the obviously correct formula for man’s distinctive nature, as if no one would ever question that man is, above all, a rational creature” (850). Swift, on the other hand, suggested in letters to Pope and Bolingbroke that man is not a wholly rational creature, but rather an animal capable of rationality. He also wrote that “[he had] got materials towards a treatise proving the falsity of that definition animal rationale, and to show it should be only rationis capax” (854); Swift never explicitly mentions the title of the work, and it is possible that the manuscript was unpublished or lost, yet it seems more likely that the mentioned treatise turned into the Voyage to the Country of the Houyhnhnms. Yet how can we be sure? How can we know what Swift’s argument would have looked like? What methods would he have used? For one, if he had written to friends that he did not think man was animal rationale, but rather, rationis capax., his argument would contested what this meant for man’s place in the great chain of being, a hierarchical structure ranging from God to inanimate objects. The traditional place for man was above animals, but below angels, and Swift’s argument did not seek to object, but rather to display how animal rationale was angel, not man. If Angels were perfectly rational creatures, and man was defined in the same way, he could not be placed below angels in the chain, and this, Swift felt, was untrue. Yet how could Swift show man’s definition of himself was flawed? If Gulliver were to travel to an island occupied by perfectly rational men and perfectly irrational horses, Gulliver would be grouped with the men and Swift would never get his argument out. What he needed was a nation of angels. Of course, he could have simply written a tale in which Gulliver travelled to an island occupied by both angels and beasts, but it is safe to argue that the Voyage to the Country of the Houyhnhnms is that tale written in disguise. The Houyhnhms are in all capacities angels; they are a perfectly rational, albeit sometimes cold race. The Yahoos on the other hand are absolutely irrational; they lack any pittance of reason and are wholly ruled by sensuality. The races are therefore dichotomous, representing the true, unfailing definitions of rationality and irrationality that could not tenably exist, yet Swift would require for his argument. Swift needed illustrations of the true extremes in order to show that Gulliver is neither Houyhnhnm or Yahoo, and allow him to represent man’s place in the great chain of being between angel and beast. With his small pittance of reason, which his Houyhnhnm master cannot imagine the origin of, and his Yahoo sensuality, the reader places Gulliver tenuously between the two races. It is worth noting that Swift’s illustration of Gulliver in the middle state is further encouraged by placing this Voyage after the first three; Swift has already accustomed the reader to Gulliver’s consistent middle state. From the first page of the book, Gulliver is precisely middle: he is the third of five children, of the middle class, and not particularly intelligent or unintelligent. In Lilliput he is too large, both in size and moral compass, and in Brobdingag he is too small in both. By the start of the fourth Voyage, it can be anticipated that Gulliver will be neither “wholly governed by reason,” as the Houyhnhnms are, nor will he be the “most unteachable of brutes.” The reader is ready to place him somewhere between the two, and this is exactly what Swift requires if he is to prove there is a difference between men and angels, and that difference is rationality. But why would Swift use horses instead of angels? Was he just being overly roundabout? In actuality, it is quite likely that Swift uses horses in order to defamiliarize one of the most common arguments used to prove Homo est animal rationale. In the same logics that represent man as rational, an example animal was always needed to illustrate an “irrational” animal. It seems particularly incriminating that the most commonly used irrational animal was the horse; Porphyry’s Isagoge makes use of the analogy, “rational is to irrational as man is to horse,” several times, and in his followers’ literature, the juxtaposition of homo and equus had been used so often that it was considered a cliché (Crane 852). Furthermore, the equation of homo to animal rationale was set against the equation of equus to animal hinnibile (852), which it seems Swift quite bluntly mimics in the name ‘Houyhnhnm’. If then, the pairing of man and horse was a commonplace in literature Swift was familiar with, and the purpose of defamiliarization is to enhance perception of the familiar and open the argument for reconsideration, then it is likely that Swift knew the effect of inverting the places of men and horses. The most important effect would have been that Gulliver does not fit preciously with either group; he has the body of the Yahoo, but rationality closer to that of a Houyhnhnm. He occupies, “the most uncomfortable position in [the] chain, since to a limited degree he shares the intelligence of higher creatures, and to an unlimited degree the sensuality of animals. He is the middle link because he is the transitional point between the purely intelligent and the purely sensual” (Monk 318). He is capable of desiring the pure rationality of the Houyhnhnm, but incapable of achieving it and must learn with horror that he more closely resembles the Yahoo. Yet herein the reader must begin to distrust Gulliver’s judgment; as Gulliver learns that female Yahoos lust after him, he forgets his link to the Houyhnhnms and bemoans his Yahoo nature. Gulliver neglects the possibility of a middle link, and instead inverts the original distinction of man as rational and horse as irrational. Here both the Houyhnhnms and Gulliver have made the same reductive mistake that Swift feels philosophers have made in their definitions of men and horses. The Houyhnhnms make the converse fallacy of accident: they have never seen a Yahoo with any rationality, and because of Gulliver’s physical likeness to the Yahoos, the Houyhnhnms dismiss his pittance of rationality. Gulliver on the other hand makes an ad hominem fallacy; despite his knowledge that he is somewhat rational, his despicable physical form overrides his rationality. He has come to accept the Houyhnhnms’ false dichotomy on the basis of physical form alone. When Gulliver returns home, he dismisses the good-hearted Captain Mendez as a Yahoo and prefers the company of the horses in his stable despite their unintelligence. He judges the form of horses and men as indicative of their rationality, and consistently misjudges. Surely, his wife and Captain Mendez would make better company, but Gulliver cannot stand them for their physical likeness to Yahoos. These uncritical and reductive schemas, Swift would argue, are inherently flawed; man cannot make define all humans as rational creatures—this would mean brain dead people are still more rational than horses simply because they physically resemble humans. Indeed, it is Swift’s overwhelming illustration of Captain Mendez as a moral human being which proves the falsity of the Houyhnhnm-Yahoo dichotomy, and by proxy, the man as a rational being definition. While Mendez is almost certainly a Jew, he embodies the Christian morality we can imagine Dean Swift much admired. Mendez offers Gulliver his best suit of clothes, feeds him extravagantly, brings him home free of charge, houses him for some time, and pays his way to back to England. Never does Mendez seek anything in return; he is the perfect good neighbor and perhaps everything that Swift thought humans could aspire to be. Yet Gulliver overlooks the facts, and dismisses him as only a Yahoo with some small pittance of reason. Swift’s illustration of Mendez as the good neighbor is almost as hyperbolic as his illustration of the Houyhnhnms as rational and Yahoos as irrational; it cannot be thought that he meant Mendez to be anything else. Mendez has no hidden motives. He is a statically good character. He is undeveloped, and serves only as a tool to divide Swift and Gulliver. We must imagine that Swift laughs at Gulliver’s poor judgment of Mendez and his simplification of men and horses. Yet Swift does not merely wish to be invective; he understands that this attitude will get him nowhere. Instead, Mendez must serve as Swift’s true ideal of what man aspire to be. If Gulliver is driven mad by an unattainable ideal, Swift surely does not wish his readers to fare the same. He has written to Pope and Bolingbroke that true misanthropy is forcing man to think he can be something that he clearly cannot. Instead, he works against the uncritical reader. The critical reader will see that Mendez has overcome his Yahoo nature in whatever way he can. He uses his small pittance of reason to good, Christian ends and aspires to be no more than he can. As Samuel Monk says, “the philanthropist will not be angry when he has to recognize the corruptions and limitations of human nature; he will settle for a creature who is capable of reason and will do the best he can with him” (317). Swift has shown no one to be perfectly rational except the imaginary Houyhnhnms, and has served his purpose to prove man incapable of the title. Gulliver’s attachment to rationality is one of pride; he cannot let go of his undeserved entitlement to it, and is led to his subsequent downfall. Through the fourth Voyage, Swift begs his generation not to be too proud and not to be overly optimistic for mankind. Humans can be better than Yahoos, but not by much. Carnochan, W. B. “Gulliver: The Satirist on Himself.” Gulliver’s Travels 2nd Norton Critical Edition (1955): 338-50. Print. “Character of Jonathan Swift, D.D., Dean of Saint Patrick’s, Dublin,.” The European Magazine, and London Review 18 (Nov. 1790): 329-35. Print. Crane, R. S. “The Rationale of the Fourth Voyage.” Gulliver’s Travels 2nd Norton Critical Edition (1955): 331-38. Print. Fox, Christopher. “A Critical History of Gulliver’s Travels.” Gulliver’s Travels (1980): 269-304. Print. Lovejoy, Arthur O. “‘Pride’ in Eighteenth-Century Thought.” Essays in the History of Ideas. New York: Capricon Books, 1960. 62-68. Monk, Samuel H. “The Pride of Lemuel Gulliver.” Gulliver’s Travels 2nd Norton Critical Edition (1955): 312-30. Print. Orrery, John, Earl of. Remarks on the Life and Writings of Dr. Jonathan Swift, Dean of St. Patrick’s Dublin. 3rd ed. London, 1752. Swift, Jonathan. Gulliver’s Travels. 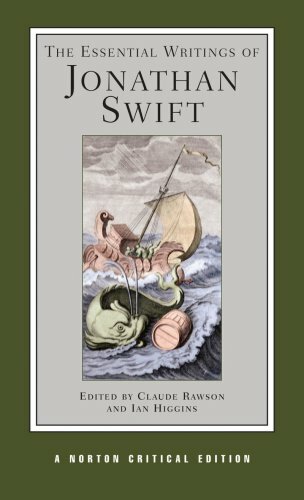 The Essential Writings of Jonathan Swift. 1726. 313-502. Print. “Swift’s Correspondence.” Gulliver’s Travels 2nd Norton Critical Edition. 263-271. Print. Ross, John F. “The Final Comedy of Lemuel Gulliver.” Tuveson 71-89. Tuveson, Ernest. Swift: The Dean as Satirist. The University of Toronto Quarterly. Vol. 22. (1955). 368-75. Want more literary criticism? Try my piece on Jane Austen’s Northanger Abbey! This entry was posted in critical debate, Gulliver's Travels, hard vs. soft, Jonathan Swift, Literature, satire, Swift, tour of literary criticism and tagged critical debate, Gulliver, Gulliver's Travels, hard, hard vs. soft, Jonathan Swift, Literature, satire, soft, Swift, tour of literary criticism. Bookmark the permalink.